How do I hide a location from view on the schedule? Admins and managers have the option to hide unwanted locations from their own view of the schedule. Adjusting this setting will not affect others' view of the schedule. This is helpful when you have managers for different locations who may not need to see or schedule other locations. Using this setting will streamline your view and reduce clutter. 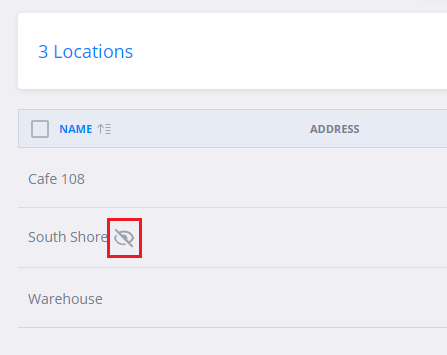 To remove a location from your view, go to Dashboard > Locations and click the position name in the list. On the next screen, click the Settings tab. Scroll down and switch the toggle to Yes, then click Save. The location will be shown in the list with this icon to let you know it's hidden from your view. It will also not be shown when you visit the schedule page until you elect to un-hide it using the same steps shown above.